If you are a fan of Pepsi products and you happen to find yourself in Walt Disney World, you are fresh out of luck. Disney has had an exclusive relationship with Coca-Cola for a very long time. With very few exceptions, wither Disney goeth, Coca-Cola followeth. Throughout the Disney theme parks, resorts and restaurants, the only cola you will find is Coke. “During the first two weeks of Walt Disney World’s operation, the Pepsi-Cola Co. was a sponsor. On the second weekend of WDW being open, they ran out of soda. So Disney contacted the Pepsi-Cola offices and tried to place an order for more soft drinks to be delivered as soon as possible. Well the person in charge at Pepsi said that because it was the weekend, they wouldn’t be able to ship anything until the following Monday. “Disney then contacted The Coca-Cola Co. 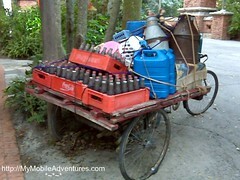 The person in charge at Coke gave the same information that due to the weekend, all the truck divers were at home. However, this person decide to go above and beyond what the Pepsi-Cola guy was willing to do. The Coke guy actually called all the drivers at home, and got them to ship all the soda the next day. So after that, Disney signed a multi-million dollar contract with Coke. Needless to say, the guy in charge at Pepsi got fired”. I really rather doubt the veracity of this story because I cannot imagine Disney “running out” of anything, much less something as fundamental as soda! Why, that would be downright un-American 😉 Even though I could not find it covered at Snopes, I did find that outlandish stories about Coca-Cola are not in short supply. In fact, there’s even more craziness in store when you look up the Disney section of Snopes. There’s another story that makes the rounds periodically which indicates that despite the fact that Disney charges their guests for soft drinks, Coca-Cola provides Disney with it’s products solely for promotional consideration. 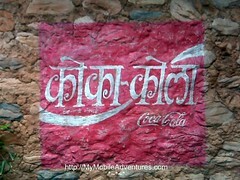 Don’t know whether or not that’s true, but Coke is surely getting a lot of exposure in the parks. The photos featured in this article were taken in just one small section of one Disney theme park. 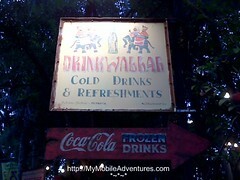 I’m not even a soda drinker, but when I pass this section of Disney’s Animal Kingdom, I’m almost tempted! I like the stories that go with the pictures! Nice post! I also like Coke so I’m in luck! 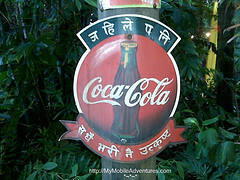 Well, you know “HAVE A COKE AND A SMILE” seems to be an ad campaign to fit with the disney/coke partnership! Certainly looks like c-c is a big sponsor of Disneyworld. Nice signs…was that one in Chinese? Way cool. I’m a coke drinker so I’d be ok there. Enjoyed the stories about Walt Disney and Coke products. I don’t have a favorite in the colas, I rather prefer seltzer (or beer) for bubbles. That said, I inclined to believe the Pepsi story – one boneheaded move can lose a customer forever. I think that I have seen it on a smaller scale. Nice Coke reds in your photos! Hey! I can actually read that last one (the one in Hindi). Considering the compulsive attention to detail that Disney is famous for — and has always been known for — I’m inclined to agree with your assessment that no way would they run out of anything as basic as soda. I mean we’re talking about the place where they check every single light bulb every single night after closing to make sure there’s not one out. Or at least they used to at the original Disneyland in Anaheim (which is the only one I’ve ever been to). And I have a hard time imagining a company as large as Pepsi not makin ga delivery to a client as big as Disney. But if they did, I’d thank the bonehead at Pepsi. I much prefer Coke, even though Pepsi was invented in my dad’s hometown.